I really like the above quote. For goals to be worthwhile, they must be SMART goals. Each year I set SMART goals for myself and my employees. The SMART goals range from personal and team development goals to process improvement goals. When I set those goals, I make sure that they are not easy to accomplish. At the same time, they are not goals that are far beyond reach and/or unrealistic. 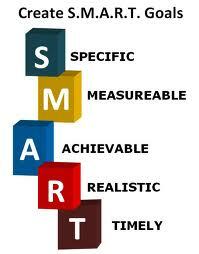 The word “SMART” in SMART goals is an acronym for Specific, Measurable, Achievable, Realistic, and Timely. For a goal to be a SMART goal, it must meet the following criteria. Goals need to be realistic. For example, if you are short, don’t have any athletic ability, and have never played basketball, you shouldn’t set the goal of being a professional basketball player. If, however, you are athletic, tall, and a basketball player, becoming a professional basketball player is a realistic goal. Set goals that are realistic so you can achieve them. Do you have long, middle, and short-term goals? Timely goals have a specific deadline or time period in which they must be completed. If you set a goal that has no time frame, you have no date for completion, and you will most likely fall short. Timely goals are very important in the business world. Companies like Apple and Microsoft hit their product goals in their specified time frame, which allowed them to obtain their current market share. Goals can be very painful or they can be SMART goals. If you set SMART goals, you will be far more likely to see consistent improvement regularly because you will have specific targets. I have found that as I have set SMART goals for myself and others, the goals have been more challenging and rewarding at the same time. They have forced me to exert more effort and try harder. Do you set SMART goals? What benefits have you seen from using SMART goals? Please share your thoughts in the comments section below!